BetCoin is a global casino that welcomes players from the USA, Australia, UK etc. Create an anonymous account in seconds with just a username, email & password. Hundreds of slots, tables games and video poker options to choose from. Wager with Bitcoin, Ethereum, Litecoin, Ripple, Bitcoin Cash or Dash. Live casino games include blackjack, roulette, baccarat, dice, poker & money wheel. 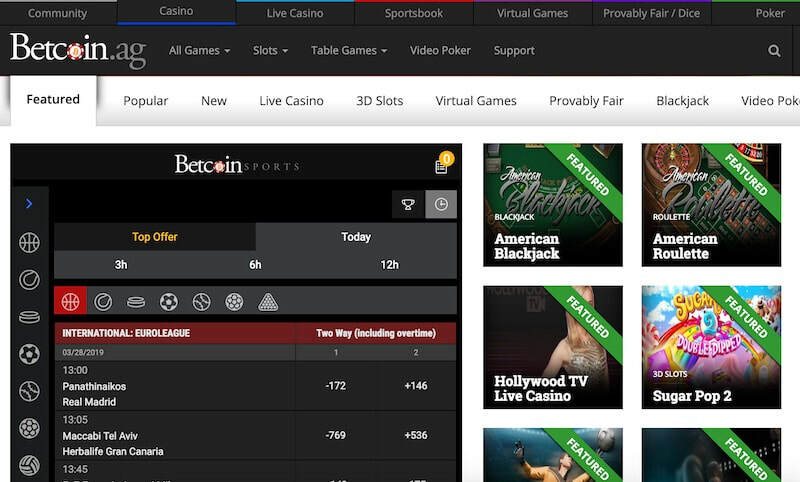 BetCoin also has a full sportsbook for betting on NFL, NBA, Premier League etc. Most of the BetCoin casino games also work perfectly on iPad, Android & iPhone. Games are provably fair and you get 10 free spins plus a 100% deposit bonus. Betcoin originally launched their platform in 2013, and they’ve done a great job at providing a secure and useful platform for cryptocurrency bettors. This is a cryptocurrency only establishment, and they offer a big list of currencies include Bitcoin, Ethereum, Ripple, Iota, Monero and several other currencies. Their casino features a large number of games, and you’ll be able to partake in everything from video slots to live casino games. Betcoin has a ton to offer their prospective players, and they have a great reputation for offering an excellent gaming experience. Betcoin’s website layout is excellent, and you’ll be able to easily filter games to find what you want. Anyone who has played online slots or table games before knows that some software developers just have better games, and Betcoin makes it easy to only display games by your favorite providers if you wish. The games look great and they’re quick loading. You can play them on both the desktop and the mobile site as well so it’s easy to play on the go. Betcoin’s account creation process is easy, and you’ll need only an email and username to get started. No other information is required, but they do reserve the right to ask for more information when the withdrawal process happens. If you’d like your account to remain anonymous then the best course of action is to make smaller withdrawals so as not to trigger a security audit. You’ll likely be able to play without any intrusion as long as you’re careful about your activities. It’s also recommended that you take advantage of Betcoin’s strong security features. This includes utilizing their 2FA authentication which can protect your account from attackers. It’s very important to do this, because if someone gains access to your account they could transfer out your cryptocurrency before you can stop them. Use 2FA to protect your funds. Betcoin offers an excellent mobile gambling interface, and it’s easy to play their casino games on your iPhone or Android. The games load and play beautifully, and you’ll be able to take part in both free play and pay to play games. 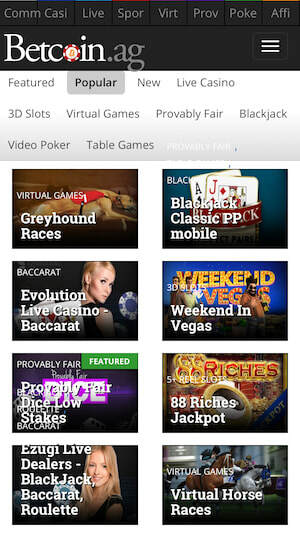 You can also participate in the live betting options on your mobile device. The casino has a slight advantage over the sportsbook on layout here. That’s because the games load in their own window, and none of the intrusive features like the live chat button are there to interrupt your gameplay which is nice. In addition to their large number of casino and table games, betcoin also offers some great live betting options. Be aware that the games you’ll be allowed to partake in will depend upon your physical location and that United States players could be limited in this regard. They have live tables available for blackjack, roulette, poker, dice, baccarat, and money wheel, which is a sort of game show esque game. The live casino offers a more personal touch to online gambling. It has live “dealers”, and you’ll be able to chat with other players, making your gambling experience a little less lonely. 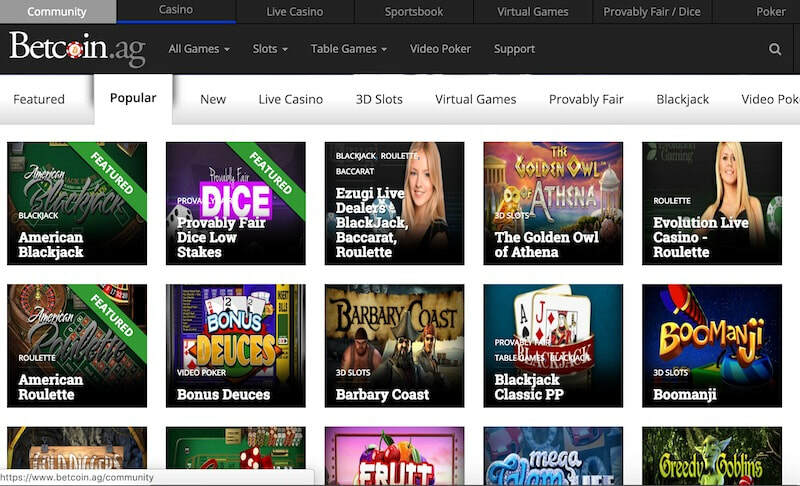 You can play the live games on desktop, phones or tablets. If you’re interested in participating in some sports betting as well then you’ll be glad to know that Betcoin also has an excellent sports book. They offer a large number of sports including football, basketball, soccer, esports and others, with a nice array of betting types. They also offer live betting options, but you’d do better to use this on the desktop site than on a mobile device. This is because they offer a lot more tools and resources to help you plan your bets which just aren’t available on mobile devices. This includes the ability to monitor exactly what’s happening in the game and charts to show you who has control of the ball and what has happened in the other quarters of the game. The mobile set up just doesn’t do the live option justice. Betcoin actually has a pretty large casino. In addition to the live casino options we talked about above, there’s also some other options to take part in. They’ve got several different sections here. If you’re unfamiliar with provably fair games, they are a type of game that allows you to verify with the utmost transparency that the house is not cheating you on your wagers. This is done with the use of hashes, and the system is intended to prove that neither the player nor the house knows the outcome of a particular roll or hand. Betcoin has provably fair variations for dice, blackjack, poker, roulette and Sick Bo. If you’d like to play some basic casino games then Betcoin has a ton of options which can be sorted based on game type or even software provider. This includes slot machines, dice games, video poker and a variety of table games. They have some very attractive options, and the games play well on all devices. You can even use the free play option to practice if you’d prefer not to risk your own cash just yet. If video poker is getting a bit too lonely for you then you can also play in some of Betcoin’s poker tournaments. They actually have a totally separate domain for this with its own bonuses, and you can win big prizes playing in their tournaments that they host. In addition to the casino and sportsbook there’s also some interesting virtual games. These are virtual betting opportunities based on sports and racing. For example, you can bet on virtual horse or greyhound races, which are some of your only race betting options on the site. The main advantage being that you can participate in these betting opportunities 24/7 and you don’t have to wait for any matches or races to take place. This is nice if you typically play in an unpopular time zone where not a lot of real races are going on. This is a cryptocurrency only platform. That means that you’ll need to buy some elsewhere to play here. You can’t use bank accounts or bank cards on Betcoin, and you’ll need to already have some crypto before you can play. The good thing about Betcoin though is their fast and flexible withdrawal policies. There’s no limits on how much you can withdraw at once, and the minimums are very low so you can gamble with virtually any amount. Betcoin allows you to get support 24/7 through email, support tickets or live chat. These options are all available on their mobile site too so you don’t need to go to the desktop version for help. This lets you get assistance quickly even if you’re not at home. If you need casual help then they also have an extensive FAQ which can give you information about all the sections of their sites including betting limits and banking information. There’s also some documentation which can clear up any confusion about betting rules they might have. 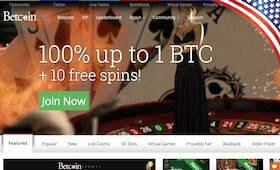 While Betcoin’s promotions are a little slim, they do seriously benefit those looking to use their casino. You’ll be able to claim a nice amount of money to use here, and there’s no hoops to jump through like with other platforms. One of the best things about Betcoin’s bonus structure is how transparent it is. There’s actually three of these, and you can claim all of them. Your first deposit will get a 100% bonus, your second deposit will get a 50% bonus, and your third deposit will get a 25% bonus. These deposits will be credited to you immediately as long as you’re qualified. You won’t need to “earn them” over prolonged periods of time or worry that you’re breaking a hidden rule to get them, which is nice. Here’s the rules. 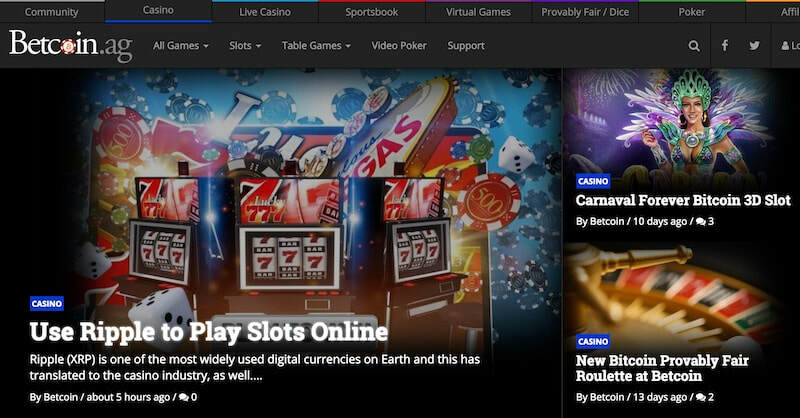 Betcoin offers their users a great platform for playing casino games both on their desktops and on the go. There’s tons of great games and live play options to keep you busy, and they offer lots of resources to help get you started if you’re not very experienced with online gambling. The bonuses are easy to claim, and they have a great support network and security features. This makes Betcoin an awesome place to play online, and if you’re planning to wager with crypto then this should be one of your go to sites.